GST is a Value added Tax (VAT) is proposed to be a comprehensive indirect tax levy on manufacture, sale and consumption of goods as well as services at the national level. It will replace all indirect taxes levied on goods and services by the Indian Central and state governments. As you know GST will going to replace over 10 central and state taxes, so obviously it comes with new concepts that will need understanding: Central GST, State GST and Integrated GST are three of them. Central GST is the component of GST that will be levied by the central government on all items, both goods and services. It only applies to intra-state trade. A dealer can use input tax credit of CGST against CGST or IGST. State GST is the component of GST that will be levied by the state government on all items, both goods and services. It only applies to intra-state trade. 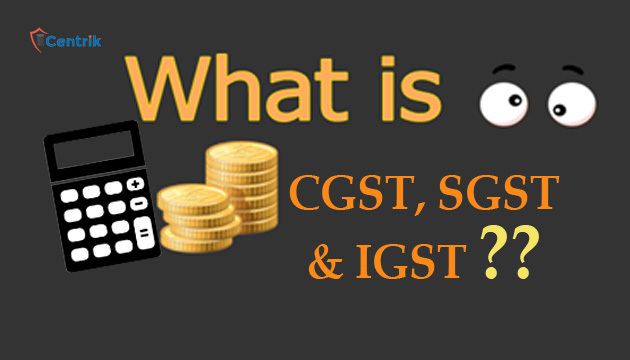 A dealer can use input tax credit of SGST against SGST or IGST. Integrated GST is component of GST that will be levied by the central government in case of inter-state trade. It is applicable on all items, both goods and services. A dealer can use input tax credit of IGST against SGST, CGST or IGST. What is the Exemption Limit? GST is applicable to all dealers with a turnover of over Rs. 20 lakh (Rs. 10 lakh in North Eastern states) in case they are involved exclusively in intra-state trade (i.e. their supplies and sales are within a single state). In case of any inter-state activity, GST is applicable regardless of turnover. The GST Composition Scheme is applicable only on traders operating in a single state with a supply turnover of less than Rs. 50 lakh. Supply turnover includes any freebies, discounts and even goods and services not liable to be taxed.